Algo Más were appointed to manage the communications and PR strategy, including social media management, for the highly successful Tourrific Prospect street party for a fifth consecutive year. The Tourrific Prospect street party, held on Monday 18 January welcomed visitors to the Prospect Road Village Heart with all enjoying the balmy weather, top tier live entertainment and cycling themed events. 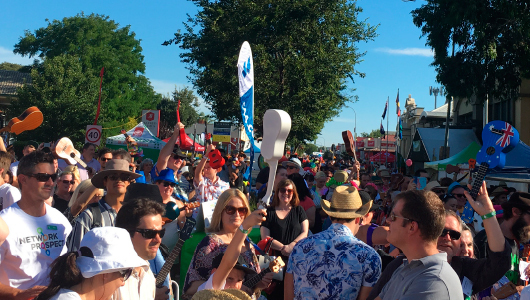 Party-goers were entertained by a whole host of exciting attractions including the very special, Tourrific Prospect Ukulele Challenge, an Official Guinness World Record attempt for Largest Ukulele Ensemble. The campaign aimed to raise awareness of the street party whilst solidifying City of Prospect’s reputation for creativity and innovation. Highlights included an extended segment on the national breakfast TV favourite, The Today Show, a pre-event weather cross with Channel 10 and coverage in national and local press. View the Today Show clip here.